Back at the end of January I did the most grognardy thing I've ever done and ran The Sinister Secret of Saltmarsh using Labyrinth Lord. I did this because some friends had been nagging me suggesting that I run a game for them for years; I was reluctant because I'm nervous enough running games for my regular group -- I always assume they hate the games I run -- so being responsible for a group of new players' first experience of role-playing games was terrifying. Truth be told, I don't think it was their actual first experience of rpgs; I suspect that at least one or two of them had a go at some point in their teens, but close enough. Like me, Courtney had read the Dragonlance novels as a child and, like me, she was unaware at the time that they were connected to a game. Later on she became a bit of a fan of Final Fantasy XII -- my favourite of the series and one I wouldn't have played if Courtney hadn't told me how much fun it was -- and Skyrim. All in all, she had quite a bit of useful background. Liam is a bit less geeky than Courtney but became a big fan of Baldur's Gate II after I circulated it among my friends, so he came to my game with a basic understanding of how D&D works. He also loves Dark Souls, so I should have killed his character off in some brutal fashion. James expresses his geekiness through obscure electronic music and James Bond films, so he was perhaps the least familiar with the topoi of D&D but he was the only one who had played a tabletop rpg in recent years, having played Fiasco, although he considered it a party game rather than an rpg. I should ask him how that happened. 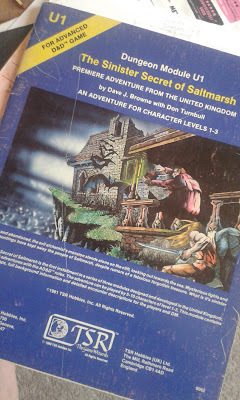 I selected Saltmarsh in part because they wanted Forgive Us but I thought it was a bit cruel for the first time out and I didn't want to put them off, and in part because I played D&D about three times before 2008 so I haven't been through any of the classics. Selfishness wins. SPOILERS follow for an adventure released in 1981, in case you're the sort of deviant that hasn't played it. We played over two days, one session in the evening and then, after a break for essentials like sleep and breakfast, a shorter session the next morning. We didn't do the second half of the adventure with the Boat of the Lizardmen™; we ran out of time and even if we hadn't, the player-characters' actions in the first half made it difficult to continue. After exploring the house and discovering the caves below, they picked off a couple of sentries and got rid of Sanbalet and his gnoll hench-, er, gnolls. Then, instead of fighting the other thieves, the party went into business with them, taking over as heads of the smuggling ring! They then went back to Saltmarsh, told the town council that the smugglers had been driven off, and collected their reward for a job not well done. That's the kind of cynical, self-serving behaviour I expect from my usual group of immoral bastards veteran gamers, not newcomers. I wonder what that says about human nature? They also thought everything was significant. For example, there's a book in the house's library, The Magical Properties of Gemstones, that is just a bit of loot to sell at a later date; the players decided that it was important and relevant and every time they found a jewel later in the adventure they would stop everything and ask if it was in the book and what its magical properties were. That's not a problem; it shows they were engaging with the game and the setting details and that's a good thing, but it was also a bit odd, because I've had players fixate on insignificant details before but not to such an extent. Perhaps the players were trying extra hard because it was their first proper adventure, perhaps it was the influence of computer gaming, or perhaps it was something else. Perhaps I should have asked. Maybe I did. It was January and I have trouble remembering last week. I do remember that they had fun -- so did I! -- and we'll probably do something similar next time I visit them in That London. If they want to stick with D&D, we may try D&D5; it's not my favourite but it does give low level characters a bit more oomph, wizards are a tad less rubbish, and it's easy to run. Sticking with D&D -- or fantasy at least -- would also give me a chance to try more of the classic adventures I've missed. All that said, what I'd love to do is unleash Call of Cthulhu on them. ...or perhaps unleash Silent Legions rpg on your group? The mechanics are similar to old school D&D but with some brilliant genre tweaks. In fact, you could even take Sinister Secret of Saltmarsh and tweak it to be a Silent Legions adventure set in the 1920s or modern day...a quaint seaside town...a reputedly haunted house...just take some of the fantasy-trope monsters and gently morph them into more of a Silent Legions thing...goblins become violent squatters, giant spiders can stay giant spiders, and so on. Anyway, that's my unsolicited two cents. (and when you get around to that Silent Legions rpg review, I'll avidly read it!). Cheers! - Brian C.
That's interesting about the players working under the assumption everything is significant. is there a stereotype in pop culture about D&D DMs trying to pull tricks like that on the players they were aware of? The 2nd campaign I was in, our DM gave us a cleric as part of our party, then revealed it was a Doppelganger, and said she thought we'd figure it out 'cause cleric cast Destroy. And I'm thinking, "I am the only person in this game other than the DM who has played D&D in the last decade, and I've done it once. How did you expect us to know a cleric shouldn't be able to do that to an evil guy?" (Plus I think our cleric in my first campaign did cast Destroy or something similar on someone else in the party, so it seemed perfectly normal to me). I think by my third campaign I was suspicious of everything (which I worked into my character's backstory through convolutions involving time travel and alternate dimensions), but we didn't get far enough in to see if that was going to pay dividends. I don't know where it came from. At first I thought it could be a result of their experience with computer games, but then there's lots of useless, irrelevant junk in computer rpgs; one of the notable things in Skyrim is you can pick up anything. Now I rather think that it's because they hadn't played a tabletop rpg before so didn't know what was significant and what wasn't, so assumed everything was. I have played in games with GMs like your Destroy GM, but they have been rare, so I can't imagine they are any sort of stereotype. I hope not, anyway.